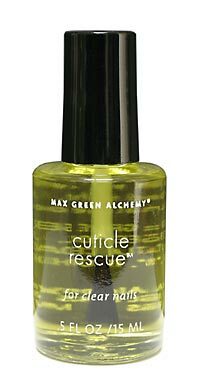 Cuticle Rescue Nail Treat is pure oil that naturally cares for and promotes clear nails with a synergistic blend of pure nourishing plant oils and protecting essential oils traditionally used for their anti-fungal action. Apply to clean and dry nail and cuticle surfaces morning and night. Be sure to remove polish first. For external use only. Avoid eyes. It takes time for clear nails to grow out: 4 months for fingernails and 10 to 12 months for toenails. Continue using Cuticle Rescue twice daily the entire time. • Cruelty-free and certified Vegan. 0.5 fl oz. (15 ml) glass bottle with brush applicator is decorated using lead-free paint. Love this product! Use on both finger & toe nails. Very helpful in the winter to keep my nails & cuticles conditioned. This product is excellent! As a middle-ager, my nails had become dry, brittle, and w/o luster. I use this product daily & the results are fabulous! My nails are beautiful. I apply the product in my car & leave it on for the 25' drive to work. I wipe it off my nails 5' before I get to work. My nails are smooth (they weren't before), clear, strong, white and healthy. This product has turned back the hands of time for my nails! I am now ordering my second bottle. Great stuff. My nails have never looked so good. Not only does it work on nails and cuticles, it also heals those little cuts and tears everyone gets around the nails.